Been browsing Pinterest this weekend and came across some boxes from Stampin Up which Ruth may recognise possibly. Haven't got any of their stuff but loved the cube one and then found some others. The blue one on the left needs some ribbon as I didn't have any to match. The front red one holds 4 tealight candles and is made from one piece of card, this was the most difficult I found. Pretty gift boxes, nicer than a bit of wrapping paper. They're super Cath, a gift in itself. 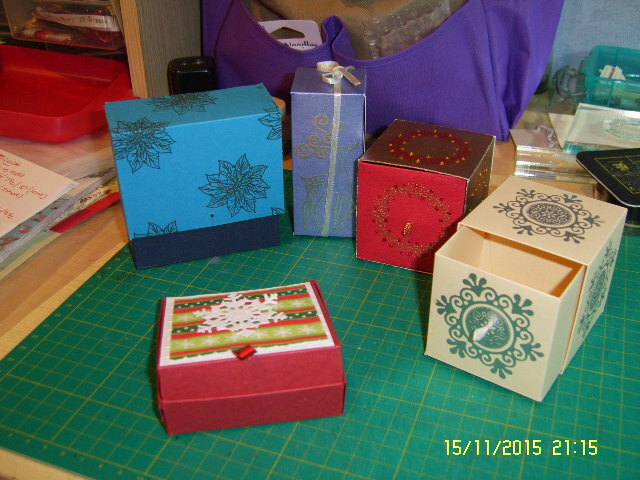 Oh, gorgeous boxes, Cath! Recipients will love those, and will keep them to use, I'm sure.